Lentils are an edible pulse, found in dishes around the world. There are a huge number of different types of lentils, including brown lentils, Puy lentils, green lentils, red lentils and yellow lentils. Each of these lentils has a slightly different flavour and the type of lentil you choose to cook with will depend on the type of dish that you wish to make. For example, yellow lentils are slightly sweet and are great for cooking in a pudding, whereas red lentils have an earthy flavour and work well with spices. 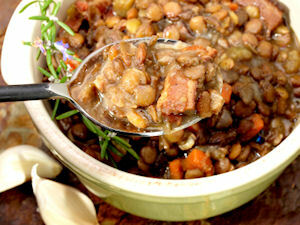 Take a look at some of the recipes below for some inspiration on cooking with lentils. Asparagus Recipes - Asparagus is a bright green vegetable cultivated in the spring and summer. Carrot Cake Recipes - A lovely, sweet cake that is perfect with tea or as an afternoon snack. Chickpea Recipes - Chickpeas are legumes that are incredibly high in protein, making them a popular choice of food all over the world, due to the fact that chickpeas are cheap, filling and nutritious. Chorizo Recipes - A spicy, paprika scented pork sausage, which is generally eaten cooked. Fig Recipes - Figs are a sweet, sticky fruit with a deliciously honeyed flavour. Because of their sticky texture and sweet flavour, they work well in puddings. Indian Curry Recipe - Getting a curry from the local takeaway can be a real treat, but you can recreate that same takeaway flavour at home in the comfort of your own kitchen. Lamb Recipe - Options for this versatile meat including burgers, pies, barbequed lamb, slow-cooked shanks and traditional roast leg of lamb. Potato Recipe - An incredibly versatile carbohydrate, you can cook potatoes in so many ways, making them brilliant to pair with almost any other meal. Stir Fry Recipes - Stir fries are fantastic meals to cook when you are in a bit of a hurry or if you are looking to up your intake of vegetables. Lentils are a fantastically good source of nutrients and protein, which is perhaps why they are increasingly becoming more popular in our cuisine. A quarter of the calories that come from lentils are protein-based, meaning that they will fill you up but with little calories or fat when compared to other carbohydrates. This tasty legume has actually been eaten for over 10,000 years and was mentioned many times in the Old Testament. Lentils are also an integral part of many different cultures — in Jewish mourning tradition, lentils are eaten by the mourners as their round shape is thought to symbolise the cycle between life and death. In Shia narrations, lentils are said to be blessed by up to seventy prophets, including Jesus and Mohammed, and in Italy, eating lentils on New Year's Eve is said to bring a year of good fortune, perhaps because of their round coin-like shape. If you fancy cooking with lentils, take a look at some of the recipes above, including a number of Indian lentil recipes, a tasty lentil and sweet beet recipe and a delicately flavoured lentil and rice pudding recipe.